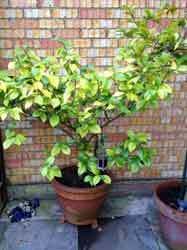 Find out how to repot a plant into a larger pot if it has out grown its current container. When your potted plants grow too large for their containers, they need to be repotted to allow the roots space to grow further. To find out when this should be, look up the repotting instructions for your specific plant species, or take the plant out of the pot and examine the roots – if they make a flat circle at the bottom of the root ball, it’s time to repot. A space in your garden that you’re not afraid to get soil on – this can get a bit messy! Step 1) Place your mesh inside your new pot to stop the soil escaping when you eventually water the plant. Step 2) Put enough new soil in the pot to fill it halfway. Step 3) Take your plant in its old pot and if the pot’s small, turn it sideways and pull the plant by its stem in a zig-zag fashion to get it out of the pot. If the plant and pot are larger you may find it easier to pull the plant out from the top. If the plant’s stubborn you can use a fork to loosen the soil, which may make it easier. Step 4) Holding the roots, use your fingers to untangle them from one another and dislodge the old soil. You should also clip any broken roots with a pair of secateurs. Step 5) Position your plant in its new pot and add the rest of the soil, patting it down over the roots. Step 6) Water the new pot generously – the soil should sink down on top of the roots. If the pot seems like it could do with more soil, then add some more and water the pot again, though only water it gently if you’ve already given the pot a good soaking. What do I do With the old Compost? There are a number of things you can do with the compost from your old pot. The first thing you will need to do before you can reuse it is remove any roots left in it, to avoid it producing plants you don’t want. The main concerns with reusing compost are the lack of nutrients in the compost and the presence of pests and disease, but this is less of an issue if you are using it to grow flowering plants rather than fruit and veg. You can remove any weevil grubs by sieving the compost, or if you really want to sterilise it you can microwave it. This will, however, kill a lot of the nutrients in the compost so you will need to add an organic fertiliser to it before you use it again. Once you’ve done this, the compost can be used for bedding or thrown back on the compost heap, or you can skip the fertilisation step and use the soil as a growing medium for seeds.